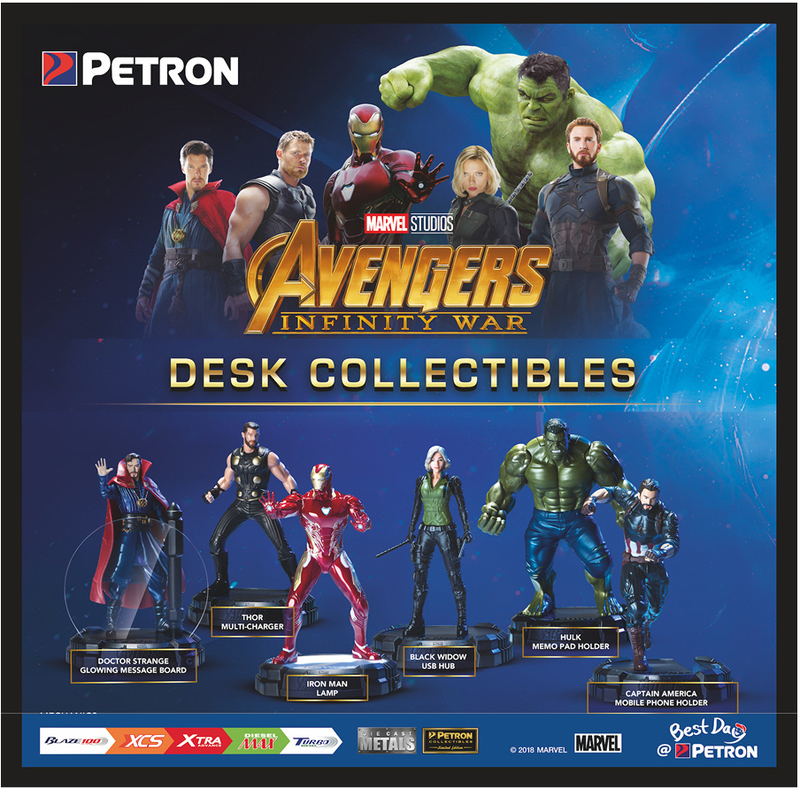 In partnership with Marvel Studios’ Avengers Infinity War, market leader Petron Corporation is offering avid collectors the opportunity to start another collection with their Avengers Infinity War Desk Collectibles. Made from high-quality die-cast metal, these collectibles are also highly functional and very affordable. There are six items included in the Desk Collectibles set: (1) an Iron Man lamp, (2) a Black Widow USB hub, (3) a Hulk mini organizer, (4) a Thor multi-charger, (5) a Doctor Strange glowing memo, and (6) a Captain America phone holder. Premium die-cast action toys usually command a high price online or at mall specialty shops. At participating Petron stations, from April 15 to May 15, 2018, every Php 500 single or accumulated purchase of Petron Blaze 100, Petron XCS, Petron Xtra Advance, Petron Turbo Diesel, Petron Diesel Max, Petron Blaze Racing, Petron HTP, Petron Rev X, or Petron Sprint 4T entitles the customer to buy one Marvel Studios’ Avengers Infinity War Desk Collectible for only Php 450. Every Php 500-worth of fuel or engine oil purchase corresponds to one desk collectible redemption at Php 450. Eligible customers may present the receipt to the pump attendant to avail of the promo. Once the receipt has been “redeemed” for the promo, any excess amount on the receipt will be void and cannot be used for another redemption. Desk Collectibles can only be bought from the participating Petron station where the customer loaded fuel or bought engine oil. The promotion is valid for cash and credit transactions; bulk purchase orders and wholesale transactions are also qualified to participate in the promo. Only receipts from the promo period (April 15 to May 15, 2018) are eligible for redemption, which is will be allowed until 60 days from the end of the promo period. For the list of participating Petron stations, visit www.petron.com. Marvel Studios’ Avengers Infinity War opens in Philippine theaters on April 25, 2018.